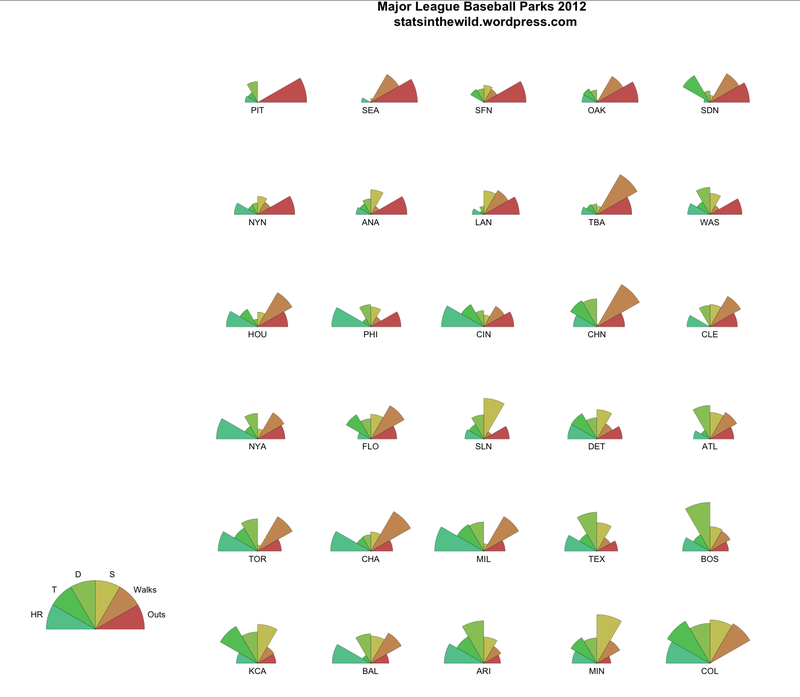 Here are some star plots for major league baseball batters, pitchers, and ball parks. The star plots represent the outcomes of a particular at bat for a hitter, a pitcher, or at a given ball park. For each plot, batter, pitcher, and ball park was varied, while the other two parameters were filled in with the average value. For instance, all batters outcomes are calculated as if they were facing J. Kinney at Wrigley Field; Pitchers data was calculated as if they were facing K. Medlen at Wrigley; and Park factors were calculated as the outcome of J. Kinney vs K. Medlen at different ball parks. The data use to calculate these were downloaded from baseball-reference.com and includes the results every single plate appearance so far this season (about 125,000 so far) and where the game was played. Six outcomes to an at bat were considered: out, walk, single, double, triple, and home run. The probability of each of these events was estimated creating a vectors of probabilities with six elements corresponding to each of the six outcome considered. I’ve chosen to display this data using the star plots below. The key to the star plot can be found in the lower left corner of each plot and displays the probabilities of each outcome relative to other batters. For instance, a large blue pie piece on the left indicates that batter’s plate appearance ends with a HR more often relative to other players. Likewise, a large red pie on the right indicates that the batter’s plate appearance ends in an out more often than other players. I’ve chosen 100 batters based on their wide range of hitting styles. In the first row, you’ll players who make outs at the lowest rates relative to other players. These include players like Joey Votto, Andrew McCutchen, David Wight, and Mike Trout. Further down, you’ll start to see players who you might describe as single’s hitters. These include players like Ruben Tejada, Derek jeter, B. Revere, and Juan Pierre. Finally, towards the bottom row, you’ll see the players who are primarily power hitters like Adam Dunn and Jose Bautista with large blue, for home run,s and orange, for walks, pie pieces, with significant red for outs. Other players on this row like Saltalamacchia, Plouffe, and Rosario have the large blue and significant red pieces, but they lack walks. The star plot for pitchers is below. The first thing we need to say here is that Justin Verlander is very, very good at pitching a baseball. Some other interesting pitchers here are Yu Darvish, Edison Volquez, and Carlos Zambrano. They seem to give up relatively few hits, but they give up many more walks that the average pitcher. These plots are ordered from highest to lowest probability that an out will be made in a given plate appearance. Pittsburgh, Seattle, and San Francisco lead the way in pitching friendly parks. 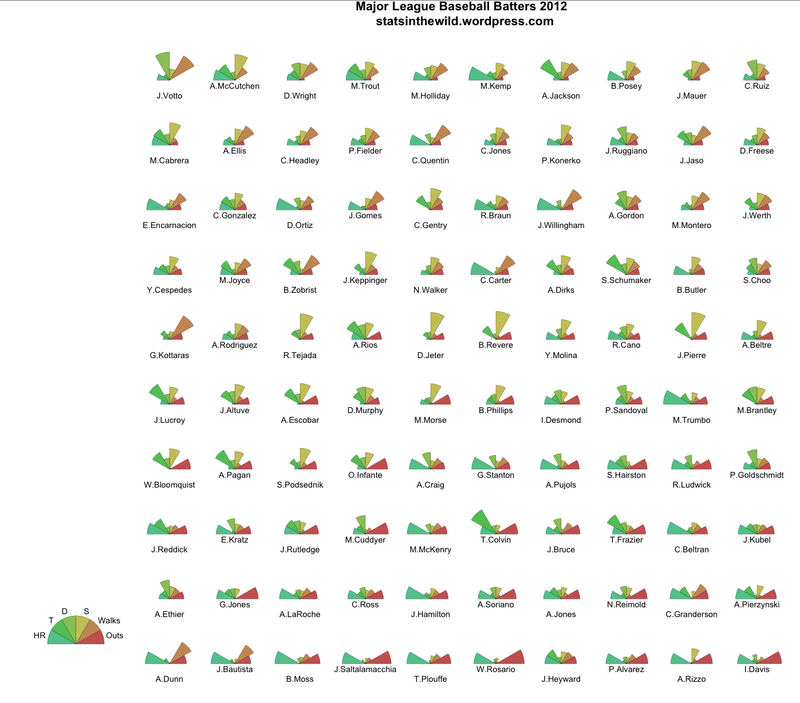 These are the same as the bottom three according to ESPNs measure of Park factor. The most hitter friendly park is, no surprise, Coors field in Colorado. Other hitter friendly parks include Target and Chase field in Minnesota and Arizona, respectively. Arizona is expected here, but Minnesota is a little bit surprising. It looks like, while it is rare to make an out, most hits are only singles, which don’t generate as many runs are their extra base counterparts. Home run friendly parks include Coors, Chase, Camden Yards, Miller, Comisky, and Yankee Stadium. Fenway park is solidly in the hitter category, but it gets that way, rather than by giving up many homeruns, by yielding a greater percentage of doubles than any other park. Posted on August 13, 2012, in Math Pictures, R, Sports. Bookmark the permalink. Leave a comment.